Time for another 15 minute card sample today. I have used stamps from :- Briar Rose Butterfly, Harebell Butterfly and words from Amazing Mackintosh words. Stamp the bobble spray in a circular pattern around the edge of the white car, using the peacock colour. Do some second generation stamping in the gaps. Spritz the card with water and put aside to dry. The colour will bleed out to form an interesting background. Press the blue inkpad onto a small piece of white card. When this has dried, over stamp it with the butterfly section of the harebell stamp. Stamp the words three times and cut out. Cut around the butterfly square. Other 15 minute cards can be seen on Chocolate Baroques design team blog. Today I have a sample using the Floral Harmony stamp. This is a pretty stamp that looks great stamped singly but is also good when masked and multi-stamped as in my sample below. I like floral stamps that can be stamped in any direction, it makes them much more interesting to use. The butterfly is from Patchwork Butterfly. I used Distress inks to colour the flowers and the butterfly was stamped onto a scrap piece of card that had the same colours on it. It was then stuck onto a black background and cut out. Words are on the Amazing Mackintosh words set. My final post for this February GDT session for Chocolate Baroque. It is a little busier than my first one. I have used the pretty Spring Awakening stamp. She is one of the four Season's stamps, all of which I like. Products used:- Spring Awakening stamp, Distress inkpads - lemonade and dusty concord, Versafine - smokey gray, clear embossing powder, black permanent inkpad, parchment paper. The words are made up of a section from one of the sayings in Let's get festive and Essence of Nature. It is useful to be able to use parts of sayings from different sets. It makes them go further. Like the Autumn card I did in my last GDT slot in October, the hair can be inked separately to make a good background. This I did with the Versafine onto a background made with lemonade and dusty concord Distress inkpads. The Lady is stamped and embossed, then coloured with the same background colours. Three sections of the primroses were stamped and cut around to make an added feature. A few of the flowers had Glossy Accents put onto them. I wanted to pick up a little of the violet colour so have mounted it onto a violet coloured card then the white card base. The words are stamped with a permanent inkpad onto the parchment and , when this had dried thoroughly, I tore around the relevant words. Thank you for visiting and I hope you have a good day ahead of you. Time for my next post. Where does the time go? When I was tidying my craft stuff, I use this term loosely, I found a beautiful background piece that I had made with my Brushos. I don't use them very often as my colours are a little bright for my liking generally. But this piece was crying out to be used. I have teamed it up with an image from one of my other favourite sets the Mackintosh Beauty. I have used her in one of my previous GDT posts, in fact exactly a year ago, but because you can snip away various parts of the design she can look different each time you use her. I like this versatility in a stamp. Brushos, VersaMark, clear embossing powder, Versamagic Aloe Vera, Majestic Blue Versafine, black Staz-on inkpad, parchment paper. I stamped the background with Versamagic and clear embossed it. I used a paint brush to wet the inside of all the flower shapes and then lightly sprinkled a blue Brusho over. The water tends to be contained within the embossed areas so the colour doesn't spread too far and the splatters spread into the sky area. The colour was spread through the petals with a fine brush. I left this to dry and then coloured the lower section with the Aloe Vera inkpad. The lady and tiny butterflies are stamped with the blue Versafine and clear embossed. Her dress was then trimmed and coloured with the same colours as the background. The words are stamped with the Stazon ( permanent inkpad) , onto the parchment paper. It was a little time consuming to cut the butterflies out but I thought they were cute. Thank you for visiting today and I hope you have enjoyed my project. It is always a pleasure creating projects with such beautiful stamps as these. It's 15 minute card time again on Chocolate Baroque. This is my contribution for this month. The background was created with Abandoned coral and Fossilized amber Distress inks and then over stamped using various elements from the three sets. The Dawn Chorus image was stamped with black Versafine. Hope you will visit the blog to see other DT members 15 minute creations. I am back again as a guest design team member for Chocolate Baroque, this being my first of three posts during February. I have used the beautiful poppy stamp from Poppy Meadow and the centre of Song Thrush. It is relatively quick to make too. Products used:- Poppy Meadow, Song Thrush, word from Loving sentiments stamps, Versafine Black and Majestic blue inkpads, Artcuts wooden heart, white acrylic paint, watercolour pencils, DL card base. The poppy has been stamped with Versafine black and clear embossed to fit onto a DL card base. I have used a heart shape as the central element. As my shape was wood and I wanted the blue to be crisp and clear, I painted it with slightly watered down, white acrylic paint. When dry, the centre of the Song Thrush stamp was inked with Blue Versafine and the heart was placed over the section I wanted to stamp. All the colouring has been done with water colour pencils. For the top and bottom edges I drew a line using the same blue as the rest of the card . Then I pulled a damp wipe along the edge to smudge and soften it slightly. The joy of the poppy stamps is that you can colour them almost any colour you like. This shape reminded me of the blue Icelandic poppies. Hope you have enjoyed my post and see you next week with my second project. 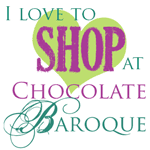 !5 minute card time again on the Chocolate Baroque blog. My card uses the lovely stamps on the Harebell Butterfly set and words from Loving Sentiments. I like these colours together and thought this would be good as a man's card, especially if they were a gardener. I have used a Pumice Stone Distress inkpad and dabbed it along a masked area of the card and then over stamped it with the same colour. The mask was then removed and the main image was stamped with black. The flower heads were coloured with pencils in a muted pink and green. Hope you enjoy the rest of the Design team samples on the blog.